Does your child have a birthday coming up soon? Are you planning a birthday	party for a child or adult? Consider an artistic party at our studio. 1 1/2 hours of fun for you and your guests. Just $7 for each partygoer,	plus the cost of the pottery painted. Parties have a 10-person, 10-pottery	piece minimum. Reservations are required with a $75 non-refundable deposit. 2 hours of fun for you and your guests. Just $10 for each partygoer, plus	the cost of the pottery painted. Parties have a 10-person, 10-pottery	piece minimum. Reservations are required with a $75 non-refundable deposit. We have a mobile division where we bring the party to your home or preferred	location. There is no muss and no fuss. We take care of everything and	offer a variety of packages. ​1 1/2 hours of fun for you and your guests. The cost is $25 for each partygoer,	which includes a glass nightlight, sun catcher or tile. Parties have a	10-person, 10-glass piece minimum. Reservations are required with a $75	non-refundable deposit. 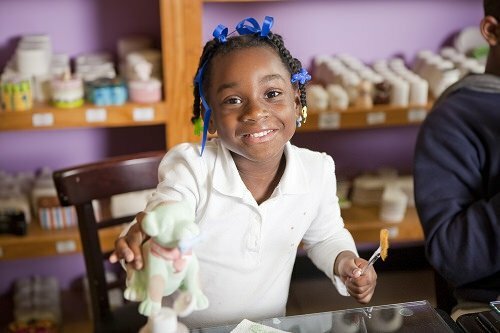 Clay Café Studios can help you plan an art party for children or	adults. Our studio setting is the ideal place to enjoy time spent socializing	while working on art projects that include ceramic painting and glass	fused bowls, plates, tiles and more. When extending invitations, make sure to let partygoers know that they’ll	be creating art, so they can dress appropriately. We recommend that you	suggest clothing with short or tailored sleeves to make pottery painting	and glass fusing easier and less messy. If you don’t want to draft your own invitations, we offer a free	invitation template that’s ready to use. Simply download and print	as many as you need. Art-themed cake or cupcakes make a great complement to your art party. If you want to make cake-decorating an interactive event, bring several	types of colored icing and let partygoers add their own personal touch	before eating. You can bring cake, cupcakes or other treats, drinks and	decorations. We also partner with a pizza place in our area that offers	a discount to our customers. We have a wide range of paintable items to choose from, including animals,	plates, bowls, mugs and holiday-themed pieces. Our staff members are extremely	knowledgeable about the services we offer and are always happy to advise	you and answer any questions that you may have. Book your next party with us!